This photo was taken in 1926. 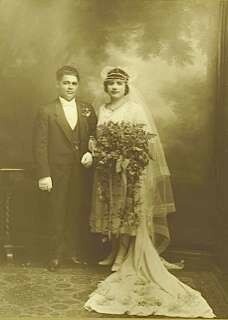 The groom is my grandfather, Peter Steve Zantiotis. Peter was born in Agia Anastasia in 1898 and arrived in Australia on July 20, 1914. His parents were Steve and Eugenia. My grandmother, Ekaterini (Katina) Moulos was from Logothetianika. She probably came to Australia not too long before the wedding. Her parents were Stefanos Moulos and Stavroula Kalopedis. Peter passed away in Wollongong on 19 November 1981 and Katina passed away in August 1984.